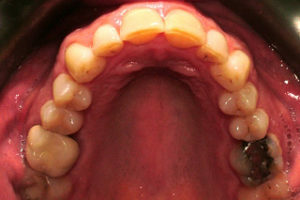 Patients who parafunction present a significant challenge because they require precise occlusal techniques. On top of that, there is a higher likelihood they will break restorations. Read on to learn how one dentist approached a cosmetic case where parafunction posed initial complications. The patient came to my office looking for a cosmetic enhancement to correct the erosion and wear he was experiencing on his teeth. With a comprehensive examination, it was clear he was a terrific candidate for the Fall Full Mouth Rehab program with Clinical Mastery Series. After an initial records appointment, the patient was fitted with a deprogramming release appliance that he wore for several weeks before attending a records clinic. 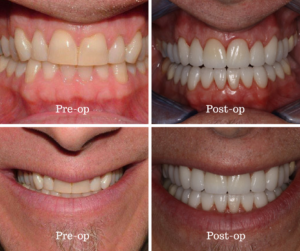 This initial clinic visit of the program included pre-operative analysis of his joint, “mock-up” smile design, open bite Apex of Force records, and the determination to slightly open his vertical dimension. Since anterior guidance was no longer present, a key to long term success of the treatment plan included creating posterior protection by restoring to the Apex of force position and re-establishing anterior guidance. 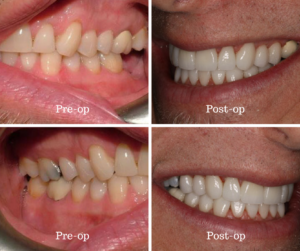 We created a restorative treatment plan, in which I prescribed a 20 unit wax-up with the anticipation of approximately 1mm of gingival reduction and further opening of VDO. The patient desired as conservative a preparation as possible to meet these goals. This wax-up was used as a provisional matrix with a siltech method. We experimented with a maxillary temporary shade close to his natural tooth color and a brighter temporary material on the mandibular arch. While the patient’s desire for aesthetics drove the case, the experience I gained after attending the CMS Ultimate Occlusion program last June made it clear that the patient’s occlusion, existence of parafunction, and conditions that caused the initial destruction must be addressed before a cosmetic enhancement could be achieved. 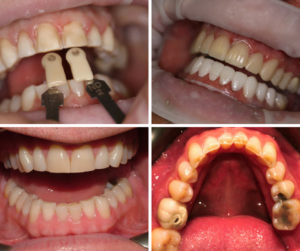 These photos document the first two stages of treatment with the restoration of the upper 10 maxillary and lower 10 mandibular anterior teeth. The patient’s molars will be completed in the next 60 days. Gold Dust did a terrific job on the ceramics, addressing slight cants as well as creating a beautiful aesthetic result for the patient with conservative preparations. Initially, I was concerned about creating a great experience for my patient during a continuing education program. By the end, it felt more like a family reunion than a CE experience. Thank you Clinical Mastery, Gold Dust, and everyone who participated in getting a stunning result that I’m confident will last! How do you treatment plan when dealing with parafunction? We’d love to hear your thoughts in the comments!